The super rare Cinerama UK Quad for Kubricks seminal sci-fi. Professionally cleaned, de-acidified and linen-backed with only minor touch-up to fold-lines. 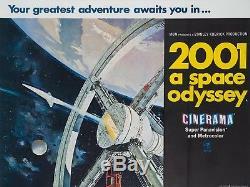 The item "Original 2001 A Space Odyssey, UK Quad, Film/Movie Poster 1968, Cinerama" is in sale since Friday, July 27, 2018. This item is in the category "DVDs, Films & TV\Film Memorabilia\Posters\Originals - UK Quads\Pre-1970".